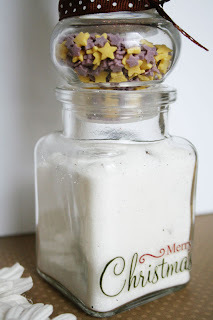 I made these little snowmen Vanilla Sugar containers after browsing Linda Albrechts blog and seeing the fab little glass snowman jars she made. I really think I will make some more this year as decoration for the centre of the table, how cute would they big made on a large scale! 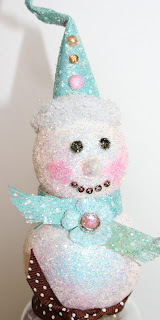 I covered polystyrene balls with Crafters Companion glue spray and rolled in glitter. 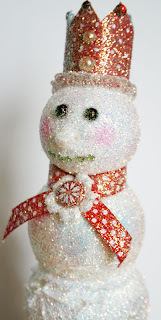 The little noses are the ends of cotton buds again glued and glittered and pressed into the poly balls. The rub ons, ribbons and papers are all Bo Bunnys Christmas line! You could fill the jars with bathsalts, sweets, jellies etc……even little notes of things to do in the run up to Christmas! Are you planning on any crafting this Christmas? Have you already started? Keep an eye on my page for so many more ideas in the run up to the festive season as I will be posting crafts, recipes, gift ideas and so much more! Ronseal Furniture Paint – Wardrobe Updo! 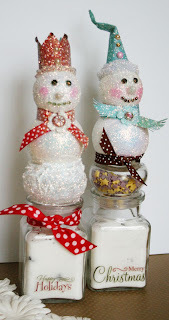 I made these little snowmen Vanilla Sugar containers after browsing Linda Albrechts blog (how amazing is she!!) and seeing the fab little glass snowman jars she made last year. I placed the head and body together with a pipecleaner inserted into both and also some silicone glue for extra stability. 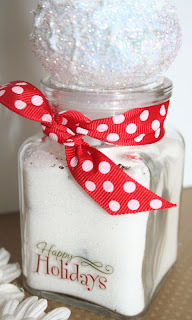 Then it comes to decorating as you wish 🙂 Cover in lots more glitter and let dry before attaching to the top of your jars with glossy accents AND silicone glue 🙂 The vanilla sugar is made using caster sugar and a vanilla pod (scrape pod, chop and mix with sugar before filling jar) I covered one of the jar lids with Aleenes glitter snow to create a larger snowman, the other jar lid was filled with decorate toppings 🙂 The rub ons, ribbons and papers are all Bo Bunnys new Christmas line!